The Gallery VOICE is the semi-public facility which is managed and planned by KYOEI ELECTRIC KILNS CO., LTD. Since 2007 the Gallery VOICE has purchased and preserved works of local ceramic artists. This collection is called the ‘Ushida Collection’ after the name of the president Takuzo Ushida. Works of the “Ushida Collection” are regularly presented at the exhibitions by the Gallery VOICE. This time from among the 16 works we have collected so far, we introduce three artists. Katsuko Nakashima was born in Osaka Prefecture in 1946, and graduated from The Design Department of Osaka University of Arts in 1969. 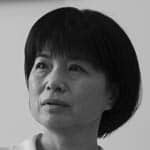 She won The Bronze Prize at The 5th International Ceramic Competition Mino(1998), The Gold Prize at The Gyeonggi International Ceramic Biennale Korea (2003) and The Grand Prize at The KOBE Biennale Modern Ceramic Art Competition(2007) and so on. As seen above, she is highly appreciated both at home and abroad. For her forming method, she uses slab building technique and plaster mould. She paints them with underglaze cobalt blue or overglaze decoration with gold and silver coating. Her works make good use of the plasticity of clay to create plastic and decorative pieces, defying traditional forms of vessel, may also be called the Rinpa-style works (named after one of the major historical schools of Japanese painting). The underglaze paintings which represent the look of the sky, for example, cloud, rain and thunder, characterise her works, which are geometrically controlled, and yet are enjoying an easy-going atmosphere. Kentaro Kawabata was born in Saitama prefecture in 1976, and graduated from Ishoken in 2000. He won awards for his work at a very early stage, including The Kamoda Shoji Award at The Mashiko Pottery Exhibition (2004) and The Paramita Museum Ceramic Award (2007). Among many graduates of Ishoken, who became active as ceramists, he is one of the especially unique artists. His works are characterized by colourful glazes and organic form obtained in terms of hand-modelling porcelain clay. He finds inspirations on the rich natural environment and the seasonal changes around his studio, or experiences in his everyday life. His use of colour pursued through various means including coloured glass chips buried in the clay and sulfurated silver, conjures images of plants or lives. In 1962, Tsubusa Kato was born into a family in Tajimi City, Gifu Prefecture, that has been living by making pottery since Momoyama Period (approx. 1583-1600 CE). After his graduation from Ishoken (Tajimi City Pottery Design and Technical Center) in 1979, he got a job at one of the local ceramics industries. At the age of 25, he discovered pure white porcelain clay and started his working life as a ceramic artist. 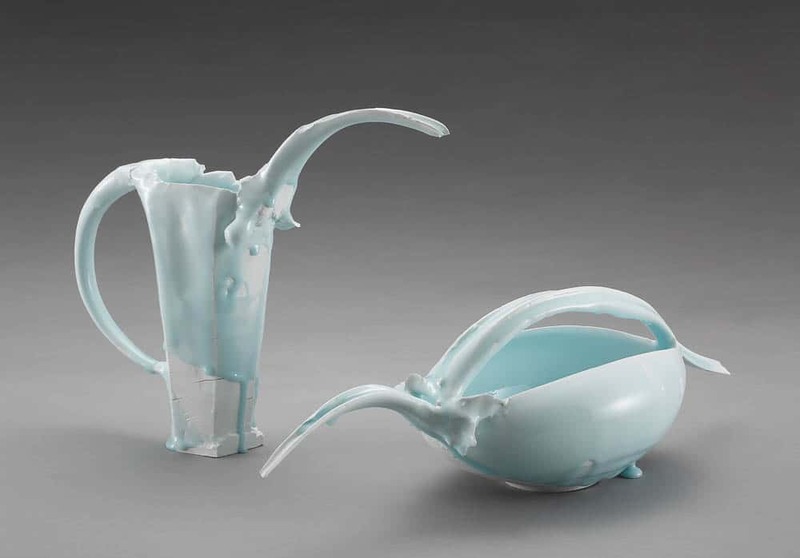 His work can be characterised by its use of bluish-white porcelain with a pointed cutting end. He created his original form by stretching clay roughly and cutting it with a sharp knife to maximize the effect of the cut surface. 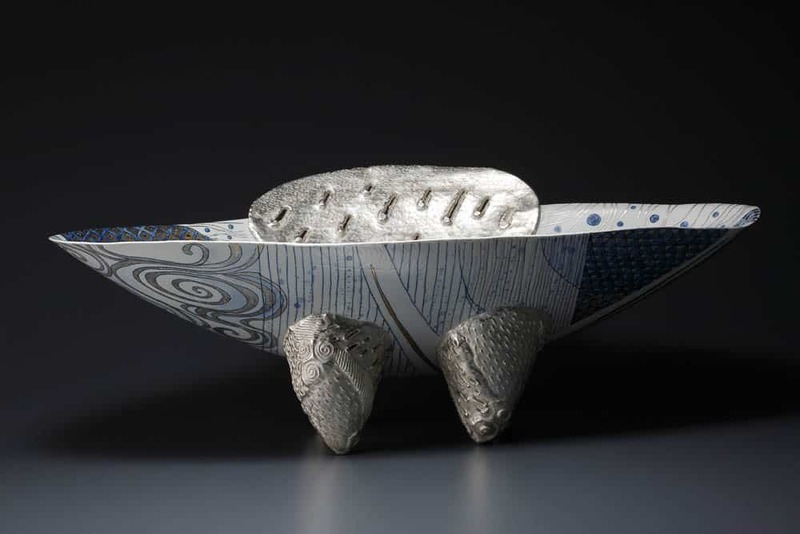 Tsubusa Kato won the Japan Ceramics Society Award in 2012. On the certificate, the reason for the award is written, “Without being constrained by conventional fixed ideas of traditional ceramic art, he drew out the attractiveness of porcelain clay, and achieved his own formative expression. His tension-filled works with finished surfaces whose edges are sharply formed, and whose glaze is as clear as crystal are highly evaluated domestically and internationally”. The Society awards this prize annually to the ceramic artist who created the best work of the year. 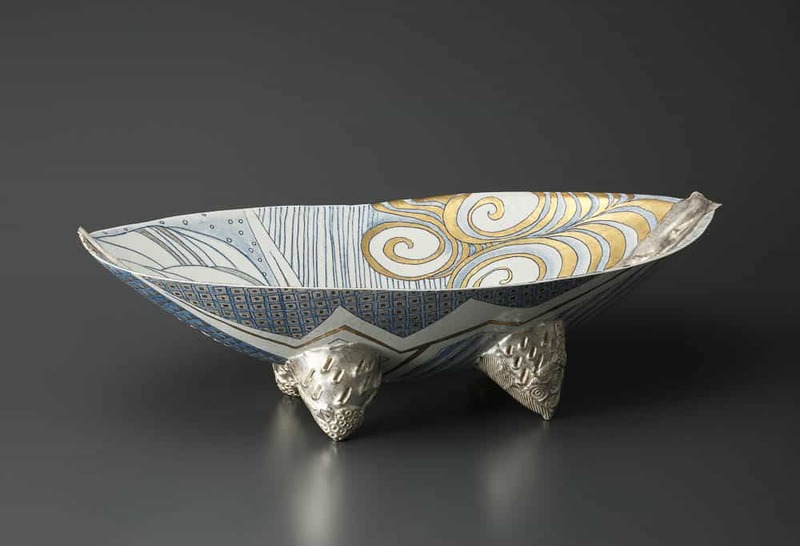 He also creates powerful blue and white works, and recently, works with overglaze painting technique or with clay dug by himself. Tomoko Kawakami graduated from Ishoken (Tajimi City Pottery Design and Technical Center) in 1978.She won the Special Judge’s Award selected by Yusuke Aida at the 5th International Ceramic Competition MINO (Japan) in 1998, and she also won the grand prize at the 54th Premio Faenza (Italy) in 2005 She has served as the general manager at Gallery VOICE since 2006.